Our Visual Tinter realtime 3D software is the real thing. Stunning graphics. See how the tint looks from the outside or sit in the car. Inventory and pricing built right into the system. Configure the types of tint and brands that you carry on hand rather than a bunch of tints you don't. Check out a preview of our 3D system and see how you can gain access for free. Call us at 1-409-363-1434 or visit our site www.visualtinter.com. You can also check out our 2D tint demo here. 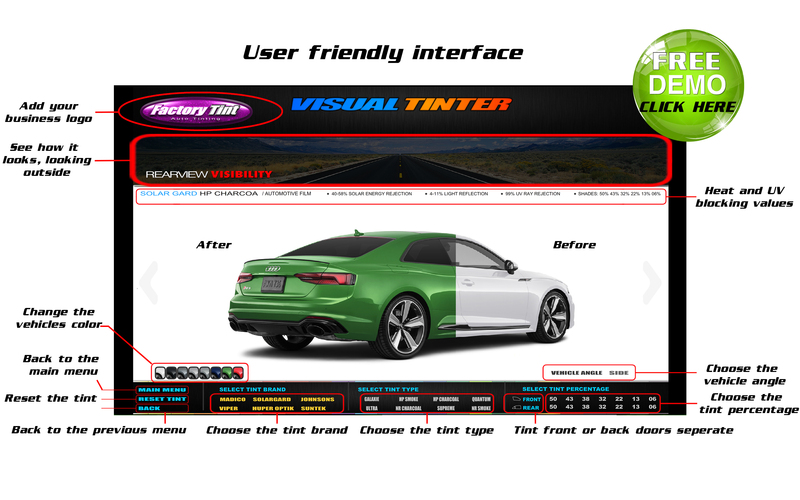 Visual Tinter 2018 Demo. This is a preview of Visual Tinter 3D beta. Offering more than just tint.